If you have a Forsythia bush in your yard, the question is not "how to grow Forsythia?" Rather.... "to prune or not to prune, that is the question." 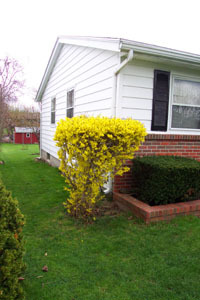 Forsythia are an extremely fast growing bush, growing up to one to two feet per year. Pruning often is a necessity. The decision to prune or leave natural, is a matter of personal taste. It's also a function of where you've planted the bush. If grown in the yard singly or in small groups, they look stunning, when left to grow naturally. If grown as a hedgerow, or along foundations, pruning maintains a neat and orderly appearance. 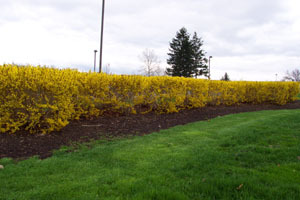 Forsythia bushes are among nature's earliest spring bloomers.Forsythia are great used as hedgerows, or planted singly. You can force blooms indoors in winter. It will brighten up any room in the greyest and snowiest of winter days. Other Names: They are also called "Golden Bell. Forsythia are grown from cuttings. Select cuttings from new growth. Cut a three to six inch branch, and place the end into moist soil. Keep the soil moist to aid rooting. Rooting should only take a few weeks. Transplant rooted cuttings anytime. However, transplanting established plants is best done in winter while the plants are dormant. 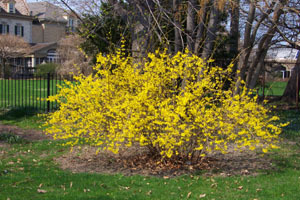 Fast growing Forsythia bushes are easy to grow. Established plants require little, or no care. Grow Forsythia plants in full sun to partial shade. They will grow well in most soils. Soil should be well drained. Water plants during extended dry periods as needed. Fertilize plants once a year in early spring. Use a high phosphorous fertilizer to promote bright blooms. People use forsythia in a variety of ways. Some let it grow naturally, like in the picture at the top of this page. Regardless of your preference, they are a strikingly beautiful bush when in bloom. Flowers form on prior year's growth, not new growth. So, it's important to prune them immediately after the flowers have bloomed. You can cut back old growth to about four inches from the ground. Don't hesitate to be aggressive in pruning these fast growing plants. They will grow back at a fast rate. Forcing Forsythia to bloom indoors is a snap. Simply cut off a few branches, and bring them indoors. Put them in a vase with water. A couple weeks later, the branches will burst into bright cheerful, golden yellow blooms, right in the dead of winter. Insect and disease problems are infrequent. Treat with insecticides or fungicides only as needed.